A short post today--stay warm out there! Some changes are coming to the financial system as part of the Enterprise Systems Upgrade Program (ESUP). (Hint: you can read about other changes, here!) 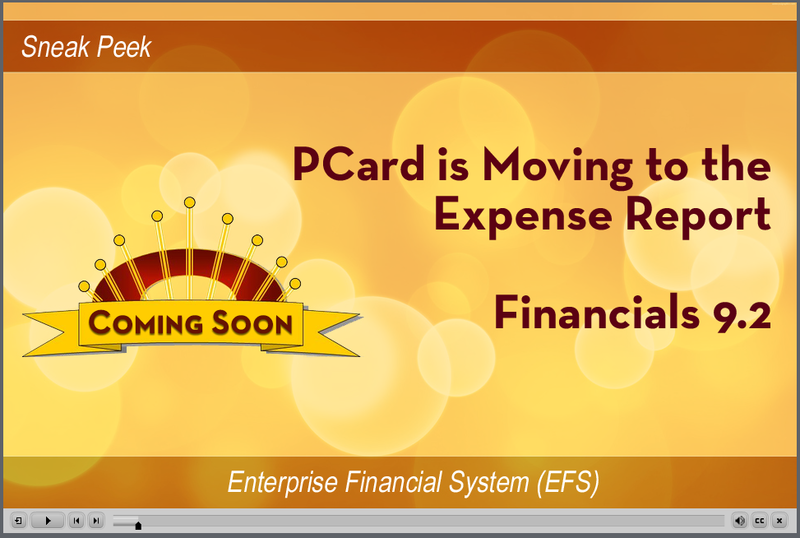 The finance team has created a sneak peek of the planned change to the PCard reconciliation process. Please take a few minutes to watch the video posted at http://z.umn.edu/pcardsneakpeek. Please share this sneak peek with those in your unit who may have an interest in the PCard process. A link to the video will also be posted on the EFS message screen. For more information about the financial system (EFS) upgrade, visit http://z.umn.edu/finance. If you have questions about coming changes as a result of ESUP, we’d love to hear from you! Please send us an email at esup@umn.edu. We’ll track down the answer and get back to you!